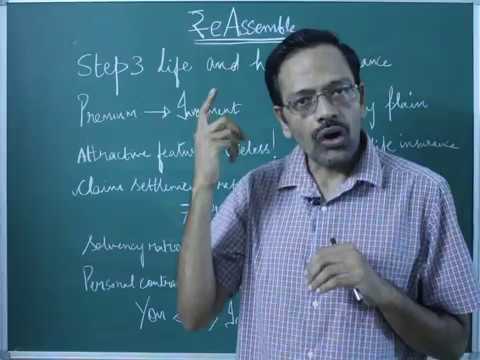 ₹e-assemble is a video series covering the basics of money management and goal-based investing for absolute beginners. Step 1 was listing Goals, Dreams and Nightmares. Step 2, laying the foundation of wealth with an emergency fund and in this week, we shall move on to step 3, buying life insurance policy. If you already have such a policy, do check if you completed these tasks: Things to do AFTER you take a term insurance policy! Also, please do share this article with friends who don’t and use the calculators linked to check if your life is cover sufficient. This week, I wanted to make two short videos, it ended up in three: Part A: we discuss the basics of a life insurance purchase on the blackboard – what to look for and more importantly, what not to. Part B: we head over to a term policy comparison portal for selecting a policy using the grand technique of inky, pinky, ponky. 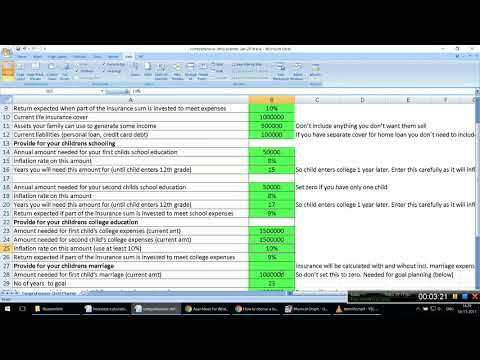 Part C: I run through the basics of a life insurance calculator. Let us first get to the videos. After that, go over a summary and additional resources. Part A: How to buy Term Life Insurance – What to look for? 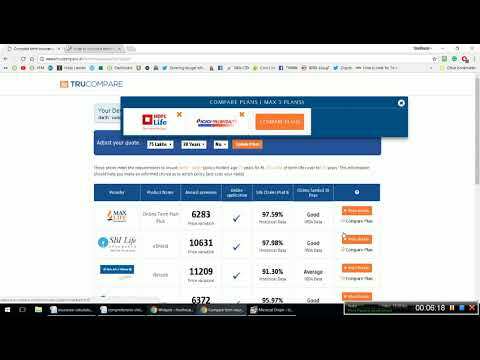 Part C: How to buy Term Life Insurance: How much life cover do we need? You may need the headphones for this one. I mention my life insurance cover as 44K, that is my health cover premium. My life cover from LIC is 10Y old and costs 36K for 60 Lakhs (loaded due to obesity and BP). Sorry for the mistake. Why LIC? Because I am opinionated and pig-headed and mis-trust privates. I only trust LIC because it is a Sarkari dinosaur (slow, but gets there eventually) not because of its high claim settlement ratio. Just like claim settlement ratio, it is psychological garbage. I have to live with it, but cannot thrust it on you. Everything has a price and in this case, I got to pay more. Thanks to time and inflation, the premium is not so big today, but it was 10Y ago. You can make smarter choices. At that time Aegon was the only online player and there was no way I going to buy from a new kid on the block. Would I change my stance now if I could go back in time? We can’t go back in time, but if we could, yes. With age I have become less stupid in some directions and more stupid in others. Why have I not changed my policy for something less expensive? Inertia (I hate change) and with age developed an auto-immune condition (Myasthenia Gravis) which meant my premium will not go down!! Find out if your employer offers a group life cover in addition to the usual group base health cover. If yes, make sure it is activated. If they also offer a group super top-up health cover, find out the conditions and the cost. If it is not too expensive opt for it. When you browse for products, some features will catch your eye. They are meant to! The more attractive the feature in life insurance and health insurance, the more useless it is! Read policy wordings to find out the real pros and cons. Do not waste time thinking about claim settlement ratio, solvency ratio etc. They are of no use. Insurance, unlike investment, is a personalized product. Read more: How to choose a term life insurance provider in 30 minutes! The insurer looks you (the wonderful and unique ‘you’) and offers a policy for ‘you’. That is the premium is a personalized number. Therefore asking others about their experience is useless. Get a simple term life cover: nominee gets 100% of sum insured in one shot upon death. Avoid policies that offer the lump sum in stages and/or pay a monthly income to the nominee. It is a waste of money. Do not take the premiums shown in policy comparison portal too seriously. They are only indicative. Remember: insurance is a contract based on good faith. Be honest while applying and provide all relevant information. Although the onus on proving fraud is on the insurer, they can be pretty good at it and sometimes even deny genuine claims: The Games Life Insurers play! and No insurer will hand life insurance claim amount on a platter! Remember buying life insurance is the first step to building wealth. If you do not invest right and grow your net worth quickly, the sum insured will lose value due to inflation! Choose an insurer and find out the maximum cover that they will offer you (based on your income and risk profile). If you are a young earner, go for the maximum amount if you can afford the premium. It will come in handy if you get married and have children. Use this Insurance Calculator for the Young if you unmarried and this Step-by-step guide to plan for your child’s education and marriage if you have children to plan your life cover needs. Be sure to write down an action plan: how should your family use the sum insured after you are gone. They may not do it that way, but at least you tried! Buy after reading; buy with confidence. A term insurance policy is just the beginning of our wealth building process. Heres hoping we stay alive long enough to burn the policy document (when the policy matures expires). You Can Be Rich Too with Goal-Based Investing, my first book is now available at a 35% discount for Rs. 258. It comes with nine online calculators. Get it now. And I will respond to them in the next few days. I welcome tough questions. Please do not ask for investment advice. Before asking, please search the site if the issue has already been discussed. Thank you. PLEASE DO NOT POST COMMENTS WITH THIS FORM it is for questions only. sir, My company provides 6 times my annual compensation pay as Group Life insurance (GLI). Should I consider that and choose a term Insurance ? Example : My annual package is 10L, then upon death I will get 60L from company under GLI. So is it wise to choose a term insurance coverage for 40L ?. So that 1crore cover will be sufficient. Use a calculator to find out how much insurance you need. Unless your job is permanent, do not include GLI.